My grandson was visiting, and he wanted to make some paper airplanes. I looked up a few, and my Twitter friends suggested a few, so I thought I would share what we found! -- The plane patterns includes the design Ken used to win the Guinness World Record for time aloft for paper airplanes - four times! • Paper airplane - The best paper airplane in the world! -- When he started folding the paper, I knew this was something different, something special. -- Just print out the template onto standard 8.5" X 11" printer paper. 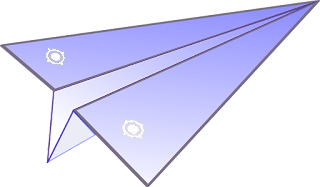 The fold and cut lines are clearly printed right onto the template, and each paper airplane design has easy-to-follow instructions.